Zurich Insurance is deploying artificial intelligence in deciding personal injury claims after trials cut the processing time from an hour to just seconds, its chairman said. “We recently introduced AI claims handling … and saved 40,000 work hours, while speeding up the claim processing time to five seconds,” Tom de Swaan told Reuters, after the insurer started using machines in March to review paperwork, such as medical reports. “We absolutely plan to expand the use of this type of AI (artificial intelligence),” he said. Insurers are racing to hone the benefits of technological advancements such as big data and AI as tech-driven startups, like Lemonade Inc., enter the market. Lemonade promises renters and homeowners insurance in as little as 90 seconds and payment of claims in three minutes with the help of artificial intelligence bots that set up policies and process claims. De Swaan said Zurich Insurance, Europe’s fifth-biggest insurer, would increasingly use machine learning, or AI, for handling claims. Carrier Management previously reported on Zurich’s use of AI claims handling for personal injury in early January. See related article, “AI and Insurance: Are Claims Jobs in Danger? 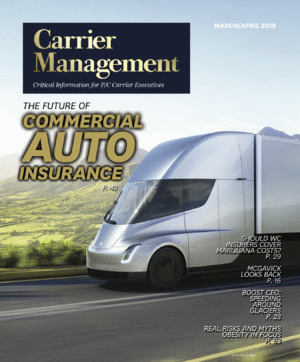 The second-quarter edition of Carrier Management magazine features more articles detailing the growing use of AI in P/C insurance, with specific examples described by executives at XL Catlin, Allianz, QBE and Zurich. See related article, “Cognitive Computing Takes Off,” page 47. “Accuracy has improved. Because it’s machine learning, every new claim leads to further development and improvements,” the Dutch native said. Japanese insurer Fukoku Mutual Life Insurance began implementing AI in January, replacing 34 staff members in a move it said would save 140 million yen ($1.3 million) a year. British insurer Aviva is also currently looking at using AI. De Swaan said he does not fear competition from tech giants like Google-parent Alphabet or Apple entering the insurance market, although some technology companies have expressed interest in cooperating with Zurich.